This is the moment authors dread even more than opening envelopes with rejections in. The first review. Will they get the humour? Will they pick the plot to pieces? Aside from the article and a photo of the book, readers were also treated to a mugshot which will have old ladies reaching for the CrimeStoppers phone number. 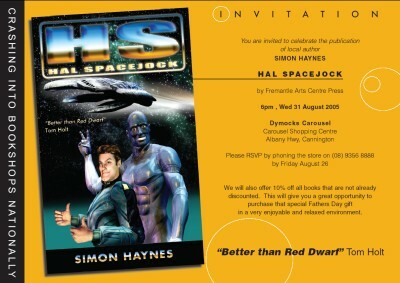 While you're waiting for Hal 2 you might like to view this totally unauthorised Hal adventure entitled Hal's New Ship. Two of them, one soon and one a long way off. The second is a three-day event called Kids' Lit 2006. This will be the fifth annual festival of children’s literature, reading, writing and illustrating to be conducted by All Saints’ College. The focus is on the promotion of young people’s literacy, and they have a packed program with about 8 concurrent streams. Over the past four years they've attracted 40,000+ visitors, and it's getting bigger each time. I'll link to the program and ticketing details once they're available online. It's a prestigious event and it sounds like a blast, so I'm very happy to be invited. Just a reminder that I maintain an appearances page on the Hal Spacejock website. I decided to put four of my previously published short stories online. One appeared in the first issue of Potato Monkey, and promptly won an Aurealis Award. 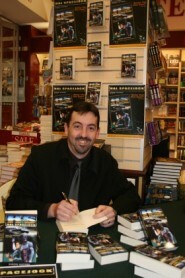 The other three appeared in Andromeda Spaceways Inflight Magazine in 2001 and 2002. 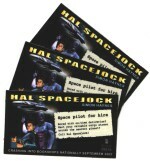 You'll find details on the Hal Spacejock website, including mini synopsis and info on original publication dates. They're all very different - Fantasy/humour, SF/humour, straight SF and a short comedy piece. 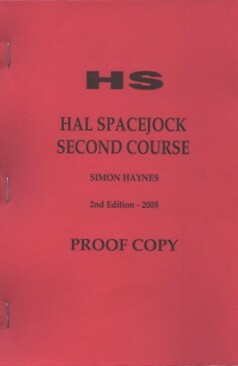 Hal Spacejock is out and Hal Spacejock Second Course has been handed in, so I'm doing what any sane mortal would do - I'm working on the draft of Hal Spacejock Just Desserts. The third book in the series is my favourite, and even after all the editing improvements to books one and two I still think it's the best of the bunch. This one was the easiest to write, too. 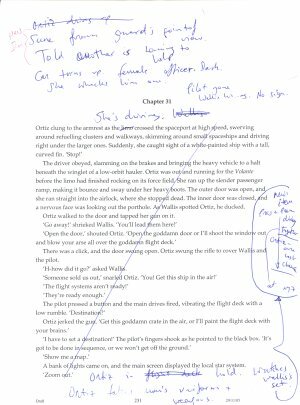 After struggling with the previous books I had a better idea of this novel-writing business. One downside to this is that I've been laughing along with book three, wondering whether I can write something like this again. I mean, now that I know the sheer amount of work involved after starting with a blank page it looks like a hell of a lot of work. Am I still up to writing fresh new books? Dymocks SF Bestsellers w/ending 17th September. Hal Spacejock debuts at #7 on the Dymocks Scifi bestseller list (week ending 10th September) Thanks to all who bought a copy! 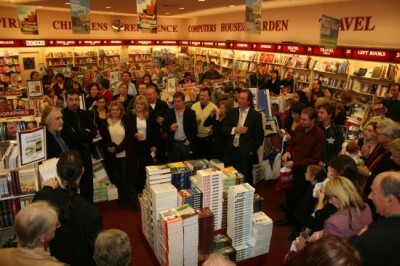 Dymocks have 80 stores across Australia, New Zealand and Hong Kong. Between 80 and 100 people circulating amongst the bookshelves, browsing and catching up with friends and acquaintances. A dozen people from Fremantle Arts Centre Press and Dymocks, trays of sandwiches and drinks. Loads of copies of Hal, gleaming under the downlights. An excited buzz. There were a couple of brief speeches and then the cash registers began to rattle and beep. It was two hours before they fell silent, and then we retired to Hans Cafe en masse for a celebration dinner. To all who attended, thank you. It was a very special evening, an overwhelming event after so many months and years working on my books with only self-motivation to keep me going. Now, when I'm struggling with a tough scene, I'll just pull up an image of one hundred smiling faces.